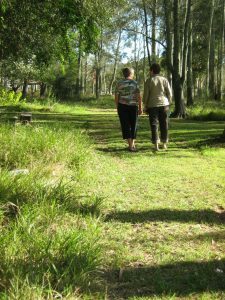 In these Easter days you are invited to join us for a guided Emmaus Walk. There is an ecological reconciliation practice called the Council of All Beings which invites us into a four-stage process of healing our relationships with Earth and all beings. It begins by grieving or mourning what has been lost and moves to a remembering of the relationships we once had. At some point in this remembering we recognise the hand of God in our lives. This calls forth from us a response. How well these words capture the Emmaus story! In this reflection we will walk with the disciples holding a sense of what has been lost in our world, our relationships and our lives; and discovering the healing that lies in memory, recognition and response. Photo by Mary Ryan rsj. Used with permission.